17.50 That’s it for us for the day, we’ll be back tomorrow to bring you all the latest news on the snap general election, and Labour’s campaign. 17.20 That Guardian/ICM polling says that the Tories have a 21 point lead over Labour, and could expect 46 per cent support, Labour 25 per cent, the Lib Dems 11 per cent, UKIP 8 per cent and the Greens 4 per cent. 17.00 There’s polling that suggest the public backs a snap general election, with 55 per cent approving of May’s decision, and 15 per cent against. That poll is from The Guardian/ICM. 16.40 Liz McInnes has suggested that she will not stand in the general election, having been elected in a by-election in 2014. She has been at the funeral of her mother today, and the shadow foreign office minister will be a real loss to the House, should she decide not to stand again for her Heywood and Middleton seat. Ok I’ll stand down. I’m not a career politician. 16.35 Emily Thornberry, the shadow foreign secretary, has challenged Boris Johnson to a televised foreign policy debate before the general election. 16.30 Margaret Hodge, MP for Barking and Dagenham since 1994, has confirmed she will contest her seat. 16.10 The Hull Daily Mail, Alan Johnson’s local paper, are reporting that he has written to his Hull West and Hessle CLP about standing down. They report that he had previously stated he would stand in a 2020 general election. 15.50 Channel 4 news reporting that number 10 have said that there will be no TV debates. This would be quite a bold move to avoid them altogether. 15.40 Commons leader David Lidington says that parliament will be dissolved on May 2nd ahead of the June 8th general election. 15.35 Alan Johnson stepping down has now been confirmed, after two decades as an MP. He’ll be a great loss to the PLP, and has been a truly great public servant. 14.58 Corbyn has put out an appeal for donors to Labour members to help fight the general election. NEW: David Davis also tells me Manchester Gorton by-election will NOT happen as MP cannot be elected to a dissolved Parliament. 14.40 Theresa Griffin, MEP for the North West, tweets that she believes the by-election in Gorton will still be held on May 4th. Some had been speculating whether the snap general could mean it would be postponed to the June 8th vote. As a colleague of Labour’s candidate in Gorton, Afzal Khan, in Brussels, it is likely that her analysis is accurate. Excited to stand again to be MP for Rotherham. Tories can’t keep riding rough shod over the country, they need holding to account! 14.15 Vince Cable has told LBC that will stand for the Lib Dems in Twickenham in the general. Many would expect him to win back the remain-backing seat he lost at the 2015 general, and the former Labour councillor could be one of multiple Lib Dems hoping to make gains at the Conservative’s expense in affluent remain areas. Given the chance to fight for Labour values – on Brexit or anything else – I’ll do it. 13.40 The BBC have some expert analysis from elections guru John Curtice, professor of politics at Strathclyde. He says the poll averages point to Tories getting 42 per cent and Labour 27 per cent, which would give Theresa May “quite a substantial majority”, he says. Whilst Labour is in a “dire position” in the polls, many seats are safe. He warns that May could make “some Conservative voters unhappy” by calling on the voters to endorse her vision for Brexit. 13.10 Hello! It’s Emma Bean, taking over from Peter Edwards. 12.50 Unison general secretary Dave Prentis has laid into the PM on Twitter and called for the scrapping of austerity measures. “Theresa May claimed she didn’t want an election before 2020. Now the British people have further proof you can’t trust the prime minister”, he said. 12.40 – Sadiq Khan, mayor of London, said the vote is a chance for the British people to give their verdict on a government “that has prioritised a hard Brexit which puts our economy at risk, while implementing damaging policies that are entrenching inequality”. 12.31 Unite has attacked May for performing a u-turn on the election and choosing to pursue a “hard, disastrous Brexit”. Gail Cartmail, acting general secretary of Britain’s largest trade union, said: “The prime minister has gone back on her word regarding an early general election and the electorate will remember that. The country now has a choice between whether to vote for a Conservative party which is determined to pursue a hard, disastrous Brexit and is wedded to continuing with miserable austerity and destroying the rights and living standards of working people, or a Labour party which is presenting real, positive change based on a fairer economy and determined to ensure that on leaving the EU, jobs and communities can thrive. Unite is currently holding its own election to choose a general secretary. Incumbent Len McCluskey faces challenger Gerard Coyne. 12.30 – Labour MPs will fight on a platform of standing up for their constituents, said Aberavon MP Stephen Kinnock, when asked about the prospect of colleagues losing their seats. “We are going to fight on that platform of standing up for out communities and standing up for our constituents”, he told the BBC. May’s statement was “chilling”, the backbencher said, because it suggested she wanted to turn Britain into an “elective dictatorship”. 12.25 – We now have a full story on Corbyn’s response. 12 Harriet Harman, former deputy leader, has said she will stay on as an MP. In formal terms she has said she will seek the nomination of the Camberwell and Peckham Labour Party (CLP). 11.50 Chris Matheson, Labour MP for the City of Chester, Britain’s most marginal seat, said he will vote in the Commons against a general election, the BBC reported. 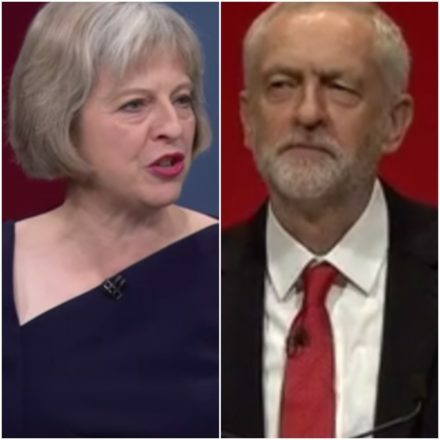 11.38 – Jeremy Corbyn has said he is glad to have the opportunity to take the fight to the Tories. 11.34 – Kezia Dugdale, Scottish Labour leader, has has said the party must work “tirelessly” to get Jeremy Corbyn into Downing Street. She published a statement saying: “This country faces a significant and historic choice as we approach the UK leaving the EU. At the last election in 2015 we said this would be a clear choice between a destructive Tory Party and a better future with Labour. Since then we have seen the dangers of a Tory government. 11.15 – Tom Blenkinsop, MP for Middlesbrough South and East Cleveland, has announced he will stand down. Full story here. 11.05 – Theresa May has stunned the country by calling an early general election. Read details in full here. It’s Peter Edwards here starting off the blog.